Putting on a dance recital is a lot of work! This year, I was blessed to spend even more time behind the scenes. Though, what I did to help out was small in the grand scheme of the show! As recital time gets closer, families start to order their tickets for the various shows. 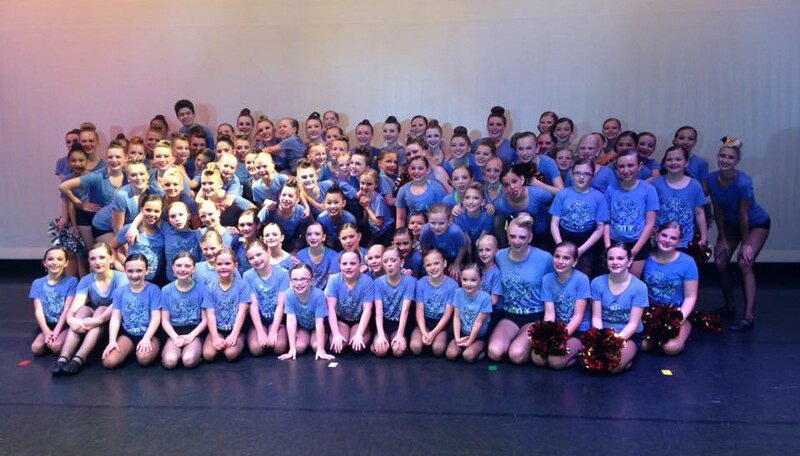 This year, Lake Area Dance Center did 4 shows: two “regular” shows with both competitive and recreational students; then, there was a solo showcase, which featured all the solos from petite through teen dancers (and a couple of duets); finally, was the Gala, which featured all the competitive large groups, small groups, and the senior solos. Miss Maria (studio owner) prints all her own tickets for the shows. I volunteered to help cut them all apart and organize them by row. I volunteered to take them home to work on them. I figured it might take me a couple hours. I was WRONG!!! It took me about 10+ hours to cut and organize them (and yes, that was cutting through 2-3 sheets of cardstock at a time)! I was shocked at how long it took. Once I got all the tickets cut, Maria and her husband (who usually helps her cut them all apart), had to assign seats to all the families who pre-ordered tickets. Other behind the scenes items that take place are: making sure flowers are available for audience members to purchase for their favorite dancers, making sure programs are printed and ready for people to pick up (some were pre-ordered, some were sold at the door), picking up items for sale at the concession table, and more. Miss Maria also sent out assignments to all the volunteers, show orders for dancers to print and have in their Duffel, last minute instructions… Oh, and I almost forgot, Miss Maria and several volunteers put together recital kits for the volunteers to use backstage. These recital kits can be very helpful, in that they contain coloring books, crayons, books to read, baby wipes, suckers, fruit snacks, markers, pencils, sharpies, and a volunteer badge to identify volunteers to parents. They also put together binders with show orders, dancers’ placements, etc. for all the teachers who were working backstage to make sure things ran smoothly. There was also a handful of others who helped with set-up that did not want to be in the picture. If that doesn’t sound like enough work, there’s the set-up for the show. Several of us showed up at the dance studio on Wednesday of recital week. We loaded up several vehicles with items needed for backstage, props for recreational groups, etc. Then, we headed over to the middle school where the show was to be held. We all worked hard and fast to unload the vehicles, roll out the flooring, set up the backstage area, tape the floors, move chairs from the auditorium to the hall for dancers to wait on… We got things set up relatively quickly due to all the help, and things were almost ready for dress rehearsal. The prop dads had to go back with a big truck to get all the large props for the competitive groups. They brought those on Friday (I think), so they’d be ready for the first show. 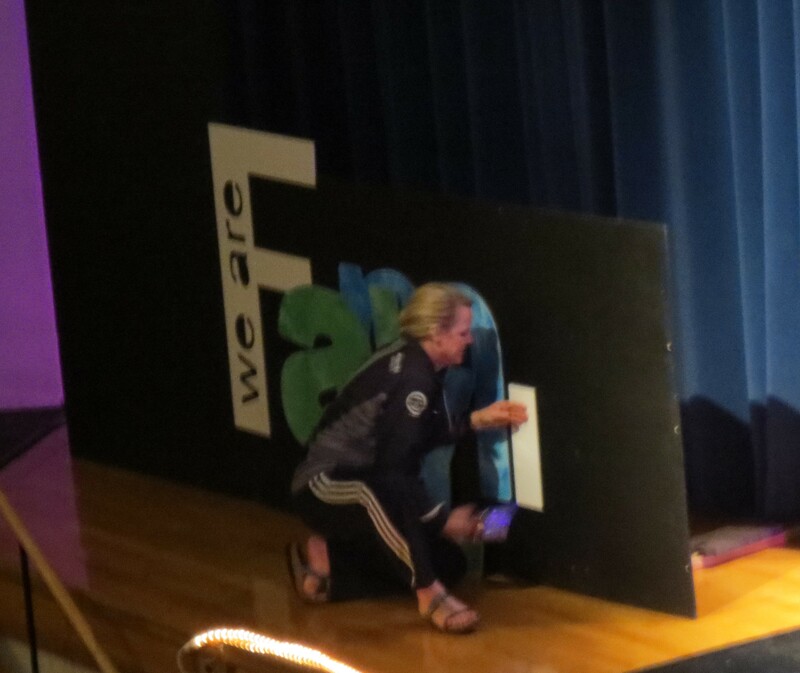 The set-up continued at dress rehearsal, as dance mom, Lori, put together the rest of the backdrop for the show. Dress Rehearsals ran in such a way that Miss Maria gave last minute instructions, and everyone ran through the finale twice. Then, they ran through the entire show (minus the competitive dances). Dancers were free to go when done with all of their dances. After the first show had their rehearsal, there was a 10-15 minute break, during which the adults had our rehearsal. Then, it was time for show 2 to do the same thing. Dances that were in both shows were split between the two rehearsals. Here we are, minus one who was just outside the picture, at dress rehearsal. This was the first recital in four years that I have been in. It was soo much fun! Friday night was Show One. I was assigned to the preschoolers, as I have been the last few years. As a preschool teacher, I thoroughly enjoy being with this age group. The first show, there were 19 preschoolers. Another mom, Barb, came to help me when she was done ushering (or whatever her job was at the beginning of the show). She was very helpful when it came to potty breaks (once one has to go, suddenly, 5 others do too), and when it was time for me to go onstage. In the hallway where the dancers line up to go onstage, there was a TV that was live-streaming the show. I was happy that the dances were spaced in a way that I got to watch my son dance on the TV while lined up with the preschoolers! I was so proud of him! Backstage, it is VERY organized chaos! Several teachers were on headsets talking to each other about different things happening. Two to three people were “runners”, going to get each group as it was getting close to time to line up. They made sure everyone was where they were supposed to be, when they were supposed to be. There were also sound & light guys, teachers pulling curtains, prop dads waiting to put the right props on at the right time, dancers, and parent chaperones. There were so many people doing so many things, but it all flowed, relatively flawlessly, to the people in the audience. For Show 2, I was again with preschoolers. This time, my group was much smaller, and I didn’t need a helper until it was time for me to go on stage. Dianne, another parent who was helping with the tots earlier, came to help me. During this show, I made a mistake during my dance (of course I did, it was the show all my family had come to see). My mom said she didn’t notice. I did, but oh well… it happens. I still had fun! The Solo Showcase didn’t need much help, though I was assigned to help with concessions, and pass out show orders. I got to sit and watch the first half of the show, until my daughter danced her solo. It was fun to see solos that I hadn’t seen before, because they were often performed at different days/times than my daughter at competitions. After watching her dance, I went back to eat, and help clean up from the potluck that was being served behind the school. The prop dads didn’t want me to take the food away, so I cleaned up some, and left the rest for the dads to take care of. For the final show, the Gala, I was helping the teens and seniors backstage with hair changes, quick costume changes, and whatever else they needed. Barb helped me out again when she was done ushering, since there were a couple girls who needed hair changes at the same time. It was very busy, but I did manage to sneak to the side of the curtain and watch a couple dances. 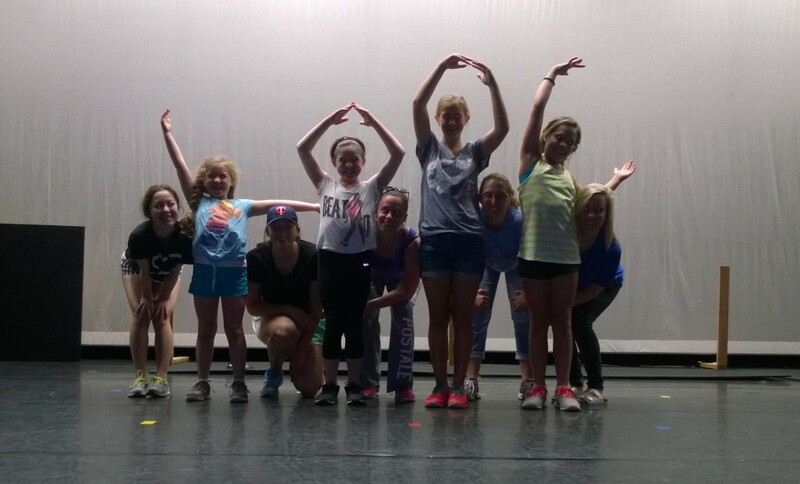 Now that the shows are over, competitive dancers have been rehearsing for Nationals which start this week. Recreational students get a week or two off before the summer dance schedule starts. Teachers are probably already beginning the process of thinking about next year’s dance recital. WOW!! !